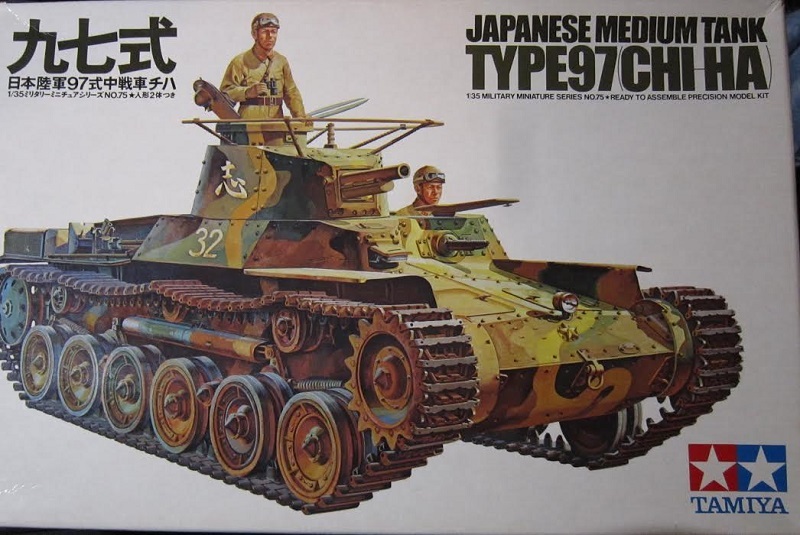 Japanese Medium Tank Type 97 "Chi-Ha"
MSRP: 14.26 - 17.10 Euro depending on where you shop overseas. The Type 97 Chi-Ha was a medium tank used by the Imperial Japanese Army during the Second Sino-Japanese War, the Battles of Khalkhin Gol against the Soviet Union, and the Second World War. It was the most widely produced Japanese medium tank of World War II, although the armor protection was average for a 1930s tank. The 57 mm main gun, designed for infantry support, was a carry over from the 1933 Type 89 medium tank. Later it was replaced by a 47 mm gun that was more effective against armor. The 170 hp Mitsubishi engine was a capable tank engine in 1938, and – notably for the time – it was an air cooled diesel. After 1941, the tank was less effective than most Allied tank designs. 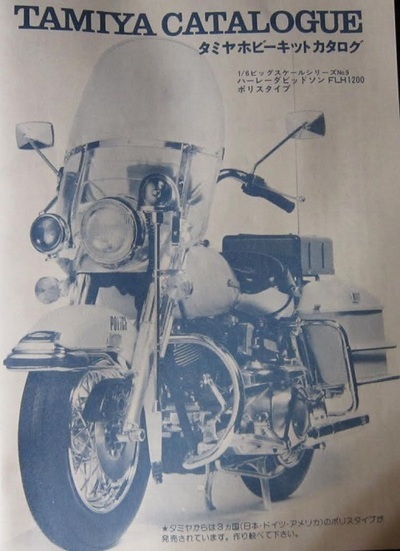 Tamiya is a older prolific model company based in Shizuoka City, Japan. They make all manner of model subjects in the popular scales. The box art shows a Chi-Ha posed against one of Tamiya's signature all-white backgrounds that they use on all their box arts now-a-days. It is in a wave pattern of tan, dark-green and brown with a narrow yellow snake-like band over those 3 colors. The turret has a white Japanese character on the sides and a white number 32 on the hull sides. The tank commander is standing in the top turret hatch holding binoculars. The driver is looking out of his hatch. One side panel repeats the box art smaller and in color, followed by what I think is the tank's history in Japanese and a color illustration of the tank commander figure, plus MADE IN JAPAN in English. These are followed by Tamiya's address in Japan. The tube of glue has hardened hard as a rock over the years and I threw it away. ​The instructions consist of of single sheet that accordion-folds out into 8 pages in 8 1/2" X 11" page format. Page 1 begins with a black and white repeat of the box art, followed by what I believe is the history of the Chi-Ha in Japanese only and a black and white photo of a real Chi-Ha. Page 2 continues with the history in Japanese with 2 more black and white photos of real Chi-Ha's. 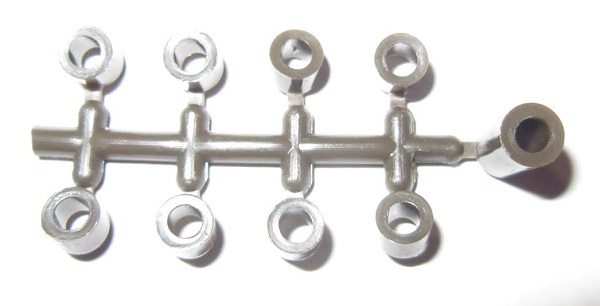 Page 2 also has the parts trees illustrations with the first assembly step below them. Page 3 through 6 continues with a grand total of 9 assembly steps. 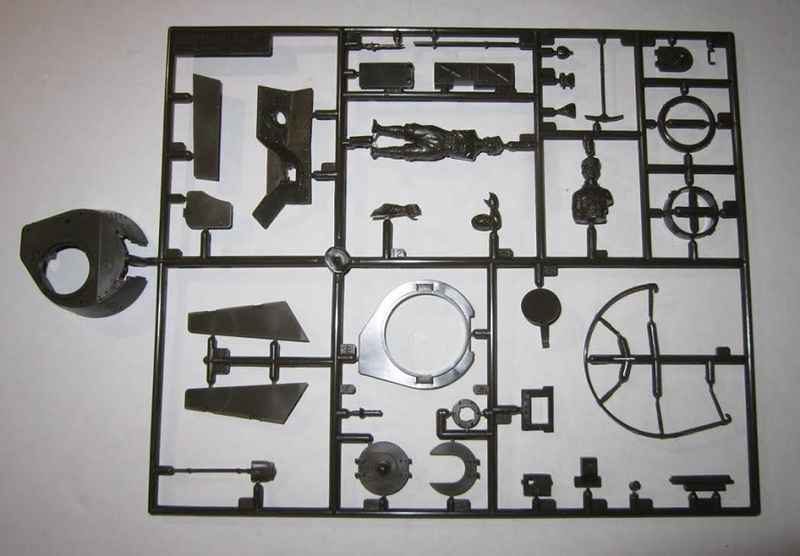 Page 7 has the painting and decaling instructions. The heading is in English, but the rest is only in Japanese. There is a 4-view of the box art paint pattern, but no markings are in this illustration. 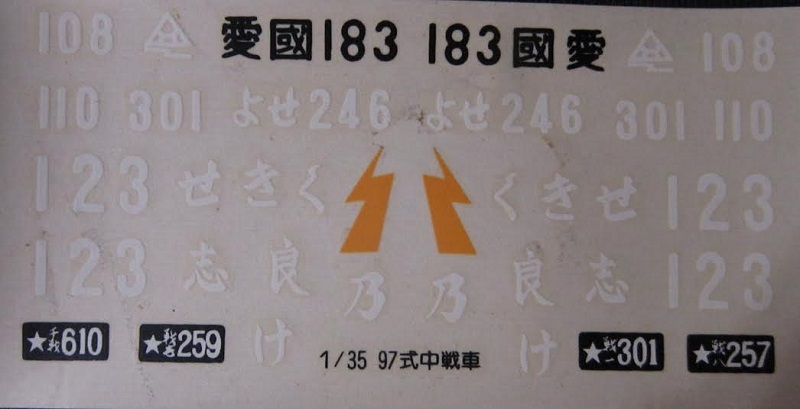 The bottom of the page has a black and white photo of the model made up in the box art scheme, but with a white number 31 on the turret sides. Page 8 continues the painting and decaling instructions in Japanese, with 6 side profiles of schemes. This is all in Japanese text, so I cannot identify them. The dark-green individual hull tub and hull top parts are next. 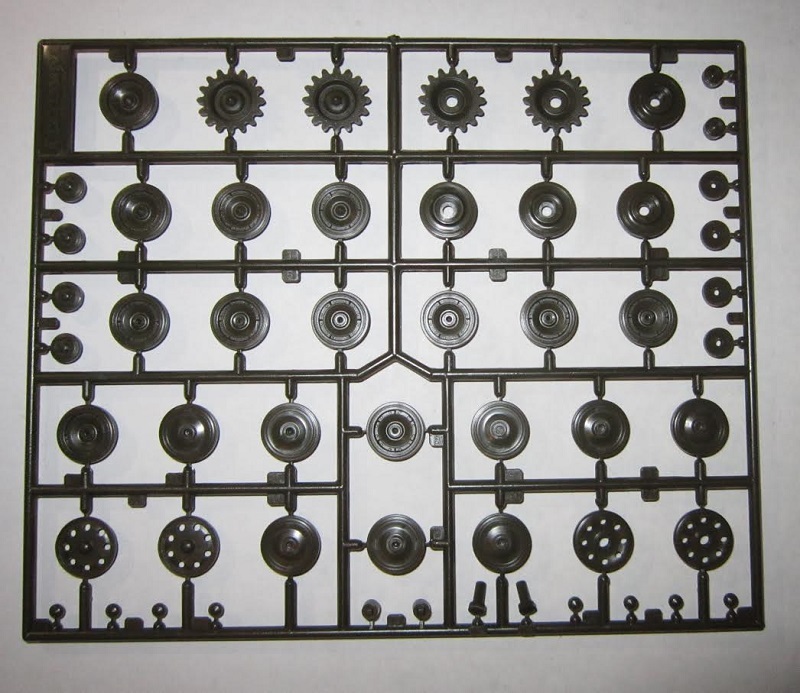 The hull tub part is common to this kit and Tamiya's motorized kit, so motorization holes will have to filled in it to do an accurate static model. ​There are 8 black vinyl poly-caps and 2 long runs of black vinyl treads. The treads are the old type that have to be heat-riveted into loops and are not the newer glueable type. There is no internal detail provided. The copyright date of 1975 is in raised letter inside the hull tub part. The hull tub has motorization holes that need to be filled to make a static model. 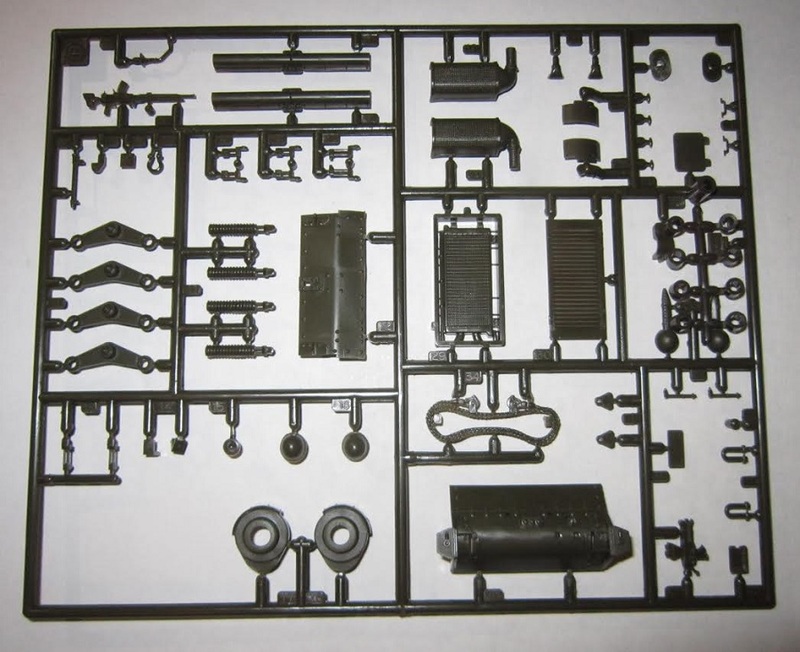 Tamiya makes a motorized kit of the Chi Ha, so the tub is common to both kits. This is a very nice kit for as old as it is. Recommended. It was re-released in 1987 with bakground scenery on the box art. That kit sells for 24.40 Euro in Europe, 22.50 pounds in the U.K. and 1800 yen in Japan. I paid $5.48 for this kit back in the late 80's. Prices have sure gone up since.